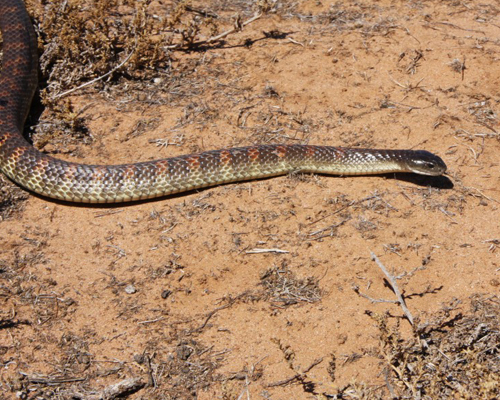 Tiger snakes are highly variable in colour, ranging from grey to olive-brown and reddish to dark brown-black, sometimes cross bands of yellow edged scales. Their underbelly can be cream, yellow, olive or grey. A solidly built snake with a broad flat head. Feed mainly on frogs, rats, mice and birds. Generally live in open floodplains, wetter gullies and watercourses, especially where there is water and cover. Tiger snakes are live bearers having up to 30 young at one time. This particular Tiger snake was captured from a doorstep in suburban Murray Bridge, highly aggressive and reaching around 1.2 meters.